Design and Sell T Shirts Online from Your Home, or a Favorite Cafe, with Customon! We are one of the fastest growing t shirts stores and we’ll show you how to make money selling t shirts. Great news is that not only you can sell t shirts online – you can also design them and pass on your message or an idea. Read on to learn how to design and sell t shirts online. Start selling designs with us today! Whether you already have a job or own a business, if you are creative and have ideas, to design and sell t shirts online may be one of the best opportunities for another or the first income. How many times have you had an idea just pop into your head when you thought: “This would make an awesome t-shirt or a hoodie”? T-shirts, hoodies, tank tops, caps, hats, and mugs are like blank canvases for your ideas – witty, cute, or funny sayings, and designs. Why not design and sell t shirts online and make money by creating your own brand of t-shirts or some other products? 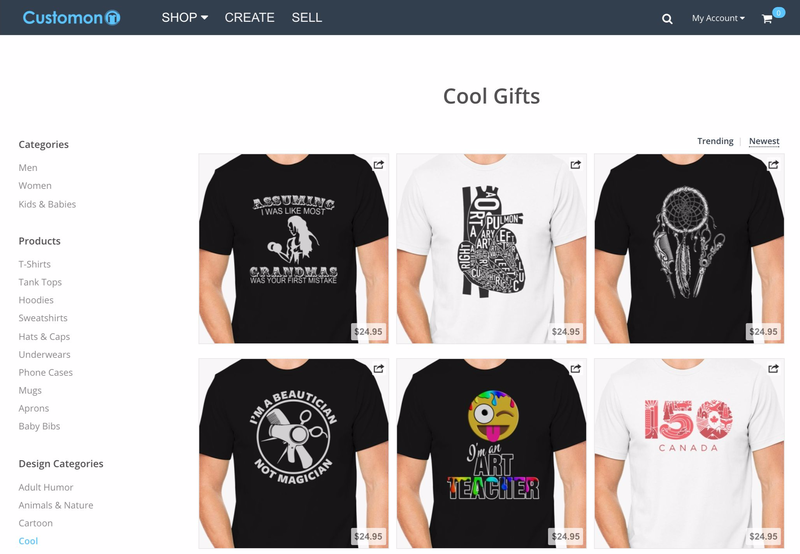 Design and Sell T Shirts Online with Customon – How to Start? Starting an online t-shirt brand and store is one of the best and most inexpensive ways to start an online business, whether it’s your first, second, or fifth business. Customon gives you an opportunity to start a simple and risk-free t-shirt business. Do you have an idea for a t-shirt, a phone case, a mug, or a hat? Have you already created a unique design but you don’t know how to put it out there? Are you ready to start designing and make money? We, at Customon, believe in you and are ready to empower your ideas and business. How to make money selling t shirts? Create your artwork with the easiest uploader and the easiest artwork management panel. Customize t-shirts, mugs, hats, hoodies. Plan your sales and set how much money you want to make per sale. Get promoted or promote your design yourself. Each time someone buys your design, we receive the order, print the product, and ship it. Your customers can track their order and reach out to us if they have any questions, anytime. Customon created the easiest artwork management panel to make the creation process as simple as possible. It’s highly intuitive and enables you to design apparel and make money with ease even if you’re not a designer. Uploading your own artwork or creating a new design right there in the panel will be a breeze and a satisfying process. Just go ahead, create an account, name your shop or a project, and off you go – start selling designs! Explore Customon and decide whether you want to start your own shop or sell on Customon Marketplace. Read the following sections to learn the differences between Customon Marketplace and Shop, and decide which one is better for you. When you design and sell t shirts online on Customon Marketplace, you get a free and easy way to give your unique ideas a life, and also to make money in a simple way. Create your design. Choose your product line – a t-shirt, a mug, a hoodie, a phone case, or a hat – as well as colors and filters you like best for each of your artworks. Set your own design price with up to 20% commission for each sale. You will earn with each sale – make money and get paid monthly. It’s simple as that because we handle all the rest. Customon takes care of the production and handling, takes care of the merchant processes, payments, shipments, and customer service for you. You just collect the money at the end of the month and plan your next designs. Also, when you’re on Customon Marketplace, you get an opportunity to get your designs on affiliate sites, eBay and Amazon. You will also benefit both from Customon organic and paid traffic. Just sit back, track your orders, and make money. Design and Sell T Shirts Online by Setting up Your Own Online Store in 2 Minutes! You can make even more money – up to 50% when you set up your own shop on Customon. Not only you will design t shirts and other products, but you will get a chance to design your own shop with our easy-to-use Shop Editor and make it truly unique. We take care of the production, handling, and the customer service for you! You only need to choose your product (or more products), a line, and ideal colors for each design. If you want to explore more options and use more channels for advertisement, you are free to do so! When you design and sell t shirts in your Shop, you cannot benefit from Customon organic and paid traffic and you don’t get promoted on eBay and Amazone. When you own a Shop, you handle promotion yourself. If you decide to design and sell t shirts online, as well as other products on Customon Marketplace, you will automatically reach thousands of daily visitors there when you publish and set up your design. If you decide to create your own Shop, you will need to find on your own a place where you’re going to be able to reach your target group and promote. Will that be advertising on a Facebook page where you will target your audience and advertise to them, or you will decide to invest in Adwords, it’s completely up to you. As a Shop owner, you decide, promote, and invest. When you join Customon Marketplace, you get your designs listed on affiliate sites, eBay and Amazon; if your product is on sale only at your designer Shop, then you need to take care of this on your own if you want to list on these or any other channels other than your Shop. On the other hand, if you design and sell t shirts online in your Shop, you instantly get an access to the feature that will help you plan and set your sales goal. For designers on Customon Marketplace, this feature isn’t available; they need to find a way to plan and set their sales goals by themselves. 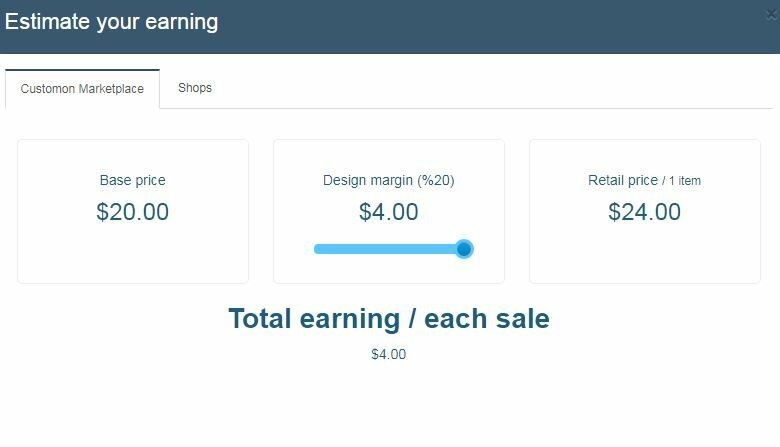 If you own a Shop, your chances for earning more money are higher as you can set up your own design price and earn up to 50%, while, if you design and sell t shirts online on Customon Marketplace, you can still set up your own design price, but you can earn up to 20% commission for each sale. When you take all of this into account, what do you think is the best option for you? We know! The good news is that you can design and sell t shirts online both on Customon Marketplace and your Shop, at the same time! If that’s the case, you will have the best of both worlds, enjoy all of the benefits, and significantly increase your chances for even more sales. Design and Sell T Shirts Online: How to Create a Design? Do you wish to upload your own, previously created artwork or you want to design on spot? Both are easy and simple! Uploading your own design requires just one click, and creating one on spot requires just a few more. 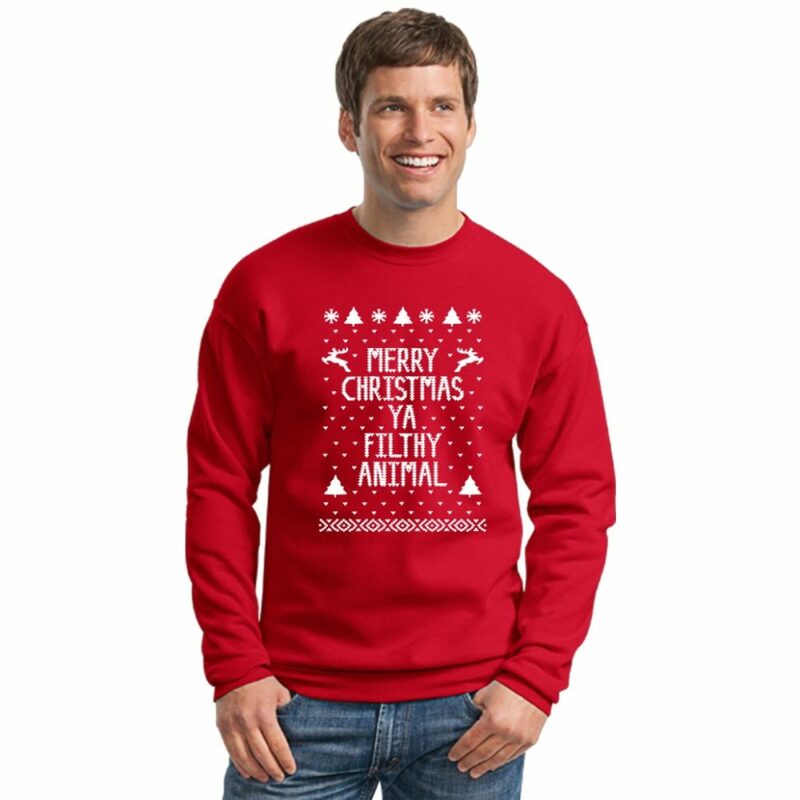 Use our easy-to-use online tool to do one or the other and design t shirts to sell. If you decide to create your artwork in our easy-to-use artwork management panel, choose from many collections we prepared for you, filter designs, and use clipart and fonts from our extensive library. You can select the type of, for example, a t-shirt or a hoodie you want to design. You can also pick more than one product (for example a t-shirt, a hoodie, a mug, and a hat or a cap). Before you start making money, you need to determine how much each shirt, hoodie, hat, mug, or onesie you design will cost. Think about the quality of your design and how much profit you want to earn. If you decide to design and sell t shirts online in your shop, don’t forget to set your sales goal. The minimum number you can set up for your sales goal in order for your products to get printed is 1. The maximum estimated monthly sale number is 1.000. Remember, your sales goal is completely up to you. 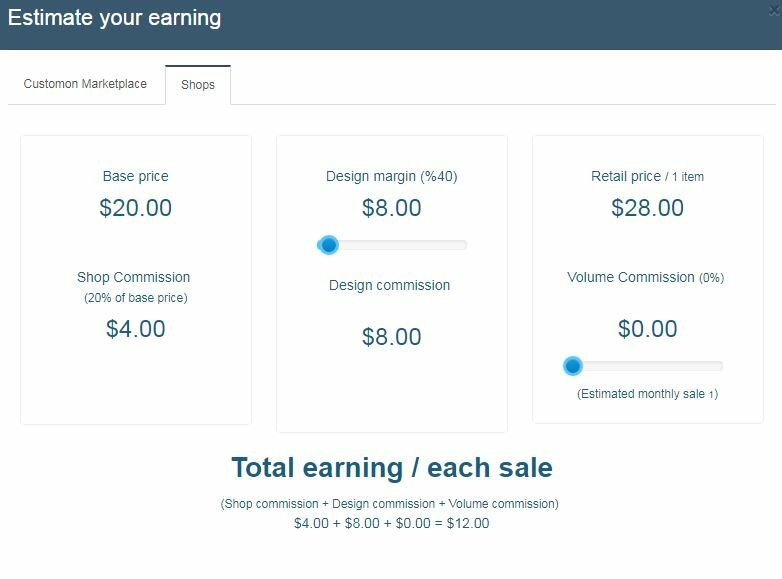 Whether you decide to design and sell t shirts online and other products on Customon Marketplace or to create your own shop, you will earn a calculated commission after each sale. Your commission will be credited into your account right after orders are delivered to the customer. You only need a bank account to get paid. However, before all this, you should decide how much you want to earn. Estimate your earnings. Use our tool to estimate the price of your artworks easily. Base price for any item you design and put up for sale is $20.00. You decide how high or low the Design Commission will be. Design Commission on Customon Marketplace can go up to 20% and cannot go beyond. This makes total earning for each sale on Marketplace – $4.00. An important benefit when you design and sell t shirts online with us and place your products on Customon Marketplace is that you get paid ads and traffic. Also, you are free to start a shop too or upload on multiple marketplaces. However, you are free to sell a design on either or both your Shop and Customon Marketplace. Compare all of this to what our competitors offer you and let us know if you find a better offer. We bet you won’t. When you design and sell t shirts online and own your Shop, you set up your own Design Commission or Design Margin. In the image below you can see that the Base Price of the product is always $20 and Shop Commission is always 20% of the Base Price. This means that we always give 20% of this base amount for each sale to the Shop owner. The Shop owner has the freedom to set up Design Margin on his own. Design Margin can go from 0% up to 500% on the Base Price. Regardless the amount of Design Margin, Shop owner always receives $4 in any case. Even if the Shop owner wouldn’t add “design margin”, he or she will make $4. This shows that selling on your own Shop gives you much higher commission amount. Having your own shop means that you can plan, calculate, and estimate your earnings with more freedom but you can also sell both on Customon Marketplace and your Shop for the best results. So, we really made this simple and easy for you. To design and sell t shirts online and other apparel with Customon is an enjoyable and risk-free process, without any previous investments. Design and sell t shirts online with Customon by creating your own design and setting up the price. We will handle production and customer service for you! If you already have an idea or a prepared design, you can probably create your own brand in a matter of minutes. Design and Sell T Shirts Online: How Much Can I Earn? There are no limits to how much money you can earn with us. Are your artworks appealing to a broad audience group or to a specific group of people? Are you using a funnel for presenting your designs? To design and sell t shirts online, as well as other apparel and products is not an easy or quick way to make money. However, it’s creative, simple, enjoyable, and an effective one. Creating designs that appeal to a certain audience is the most important starting point. If you decide to design and sell t shirts online on Customon Marketplace, we will get your merchandise in front of your audience – provide you with paid ads and traffic. 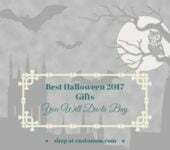 You will also get your designs listed on affiliate sites, eBay and Amazon, too. If you decide to design and sell t shirts online by starting your own shop, then you should decide on using a specific funnel, social media, buy Facebook or Instagram ads, and other ways of promotion. We do not charge anything else or any other fee to a designer but base price. While making payouts to designers, we pay the full amount after tax withholding base on designer’s country. You can decide to create your designs yourself, or you can hire a designer from Upwork or Fiverr. This will affect your earnings. It’s up to you to decide what designer you’ll hire and how much you’ll pay him or her. Try to create a fine balance between a designer cost and a design quality. The quality should never be compromised but you also need to create a product that will sell, meaning that it should have a reasonable price. Your earnings will depend on whether you choose to design and sell t shirts online on our Marketplace or you decide to design and sell t shirts online and other products in your Shop. The amount of money you make will most definitely depend on the designs you create and on the successfulness of your promoting efforts and targeting the right groups of people. The production, the product quality, and the customer service is something you needn’t worry or even think about. We love what we do and we guarantee the top-notch quality of every product and service we provide. Now that you have all the facts, learn how to design and sell t shirts online, how to publish your product design, and promote. If you have your design ready, you can publish it in just a couple of minutes on Customon easy-to-use panel. After publishing it, planning your earnings and sales goal, you should target your audience. Are you familiar with or know a lot about a specific community? If you have some kind of access to a specific group of people connected by mutual interest or hobby, you should use the opportunity and design t shirts and other products that they will be interested in. Are you a member of a book club, a gardening community, or a baseball team? Inspiration is everywhere around you! However, if you don’t want to get niche-oriented, pay attention to different trends, seasons, and buzz topics. Popular events from the world of sport, film, music, or celebrities can inspire best-selling t shirt designs. Then find a way to promote your designs and get them in front of your target group. Post and promote your designs on social media, pin your Tweets, post the design on your Instagram page, create a YouTube channel, create a sponsored ad on Facebook, and target the right people. And whatever you do when you design and sell t shirts online, do not forget the people around you. Some of your designs may be very relevant to the people who surround you every day and who would love to support you, buy your merchandise, and spread the word about it far and wide. 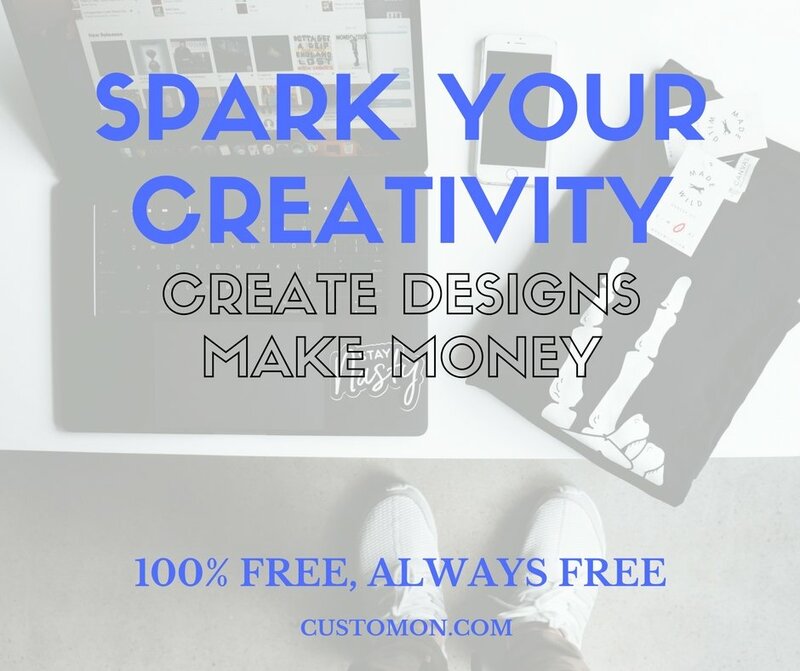 Customon is a t shirt store that reaches thousands of people every day through the Marketplace and many designers and entrepreneurs create and sell with us. We print with love and have more than 10 years of experience! With us, your designs are safe! We don’t outsource the production. All of the products and designed and printed in the U.S. When you create a design, place it for sale, and we receive the order from a customer that wants to buy it, we handle the production in-house. This is the reason why we succeed to ship orders in 1-2 days, whereas our competitors take up to 7-14 days! 95%+ is the positive feedback we receive constantly for products and service quality. Materials that our products are made of is something that we are also very proud of. Soft and smooth cotton, lightweight fine jersey, and dishwasher and microwave safe material for mugs shows that we care and that we don’t compromise the quality. Customon will see your order from the beginning point until your customer receives it, and make sure everything runs fast and smooth, to yours and your buyer’s satisfaction. And, of course, your customer can always track the order and make sure that it’s on its way. When you decided to design and sell t shirts online, have you thought about designing a hat using the embroidery technique? Not many of our competitors offer this design option. Create the perfect and unique design using embroidery technique on the hat and cap models you choose. Just make sure to always create high-quality embroidery files and follow our guidelines to get high-quality results. If you’re not sure about your graphics or you think you need advice, a suggestion, or you need help, feel free to reach out to our design services team. To design and sell t shirts online Customon chose digital printing because of its photographic-quality graphics, crisp text, and vibrant colors. Digital printing is also cost and time effective, which means your product will look its best for the minimum base price. 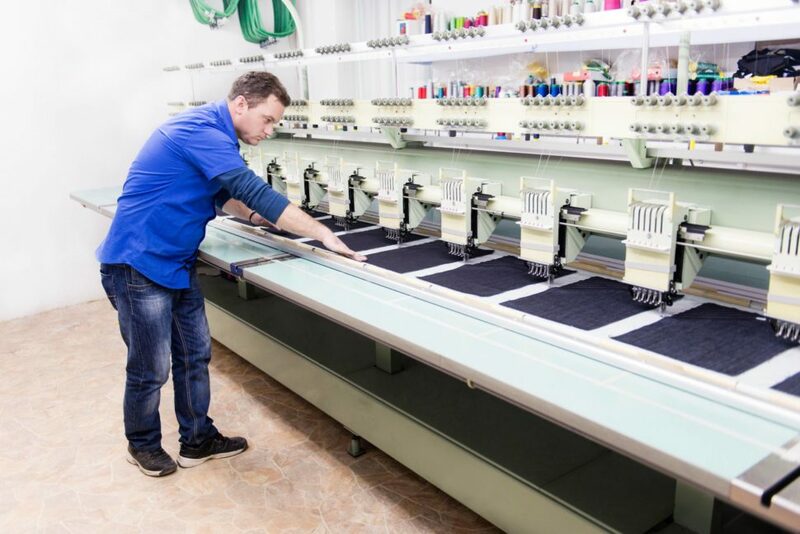 It will require minimum production time which means a shorter setup time so your t-shirts, mugs, hats, hoodies, and other products of choice are printed faster – and your customer receives the order shortly. When it comes to the looks of your s shirt designs, digital printing produces graphics of the highest quality that will grab attention with clean and crisp images and life-like colors. From startup businesses to large-scale enterprises, many choose digital printing because many designs can be produced in a short period of time, without any delay. We chose it too because we believe in the highest quality products and fast and top-notch customer service. Whoever said: “Make money, not friends”, didn’t think right and we doubt he achieved any success at what he did. An important part of any success is teamwork – efforts that parties make to achieve their mutual goal. Here, at Customon, your goal to design and sell t shirts online and succeed is our goal too! 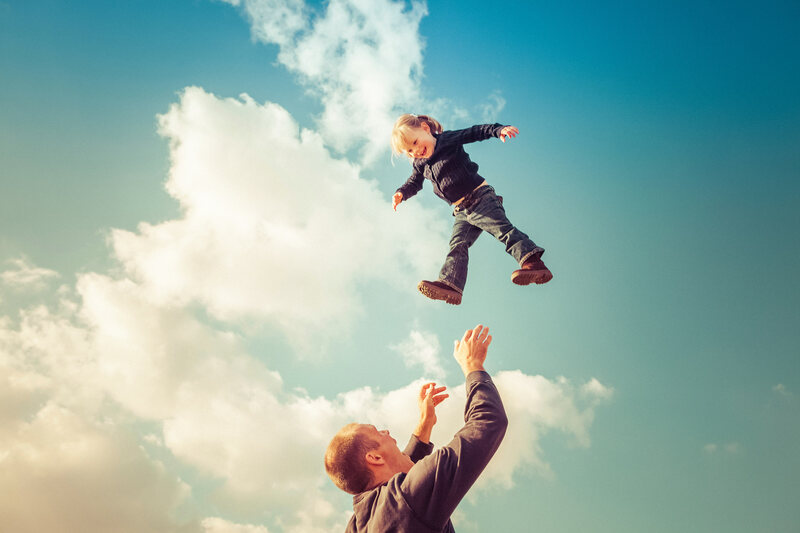 We do everything to make your goal possible. You design and sell t shirts online with us – we create the best quality products and make sure they reach their destination on time, if not sooner! Don’t forget that Customon is so much more than t-shirts! Add mugs, onesies for babies, sweatshirts, tank tops, underwear, and phone cases to your campaign. The experience shows that if you add some non-apparel items like mugs and phone cases to your campaign, your audience will be more likely to purchase multiple items, like a t-shirt and a mug, or a hoodie and a phone case. Try it and increase your chances for a sale. Be creative when you design and sell t shirts online. Don’t forget the importance of having your own brand. Don’t hesitate to say who you are and why should people be interested in your brand. We know you are unique, so show it! Design and sell t shirts online, as well as other products, with Customon! Start selling designs! And don’t hesitate to reach out, contact us.